How would you define yourself, personally and professionally? I consider myself a likable, tenacious optimist, the type of person that is busy with a lot of things but always with a smile. Those who know me as a professional would say that I am determined and analytical, always trying to improve myself. These characteristics have ensured that I have been able to overcome challenges in the company regularly. If there is one quality that best defines me as a person and a professional, it is my optimism. My determination gives me the confidence to know that I can the goals that I set for myself. Your background is in engineering. What made you decide to do a Master in Marketing? What was your goal? My main reason for wanting to do a Master in Marketing was to acquire the skills that I found lacking my technical background and that I had not been able to develop previously. I wanted to complement my academic education with something much more related to my career goals of creating and growing a company. I was interested in the Master in Marketing because it could provide me with the skills necessary to create, manage and grow a company. These were skills that I had not been able to develop in my undergraduate education. Why did you choose EADA? What attracted you to the programme and the school? Choosing a school was very difficult. When I started my search, there was an overwhelming number of schools, none of which I was familiar with, and all with vastly different programmes and tuition rates. I finally chose EADA for the programme focus and methodology; not only was the actual material covered interesting, but the methodology was also unique among the schools I looked at. EADA integrated case studies from real companies into every class, and coming from engineering, the fact that the classes were very practical was a deciding factor for me. Moreover, I was attracted by the profile of the faculty as well as the personalisation of the application process and interviews. What aspects of the Master would you highlight? I would highlight two aspects of the Master. First, the faculty. The faculty have experience in both business and academics, which makes for enjoyable and productive classes. Secondly, the course is very well organised. You learn new concepts and put them into practice in a very natural, logical way. Although the programme is very demanding, the approach used makes learning comfortable for participants. Do you have any stories you would like to share? 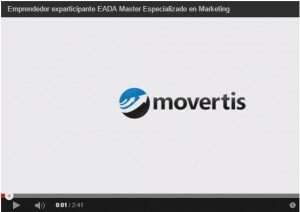 I would like to tell you about the first time the participants of the Master Internacional en Marketing went to EADA’s Residential Training Centre. Although we hardly knew each other, we were able to carry out a series of outdoor activities in which we had to guide a blindfolded classmate, let ourselves fall, trusting that our classmate would catch us, etc. It was very fun, and allowed us to see that social skills are a very important aspect of professional development.